They meet in the former Railway Mission building. With the advent of the railways, the need for men to work on the Sabbath brought about the railways’ own church – the Railway Mission. 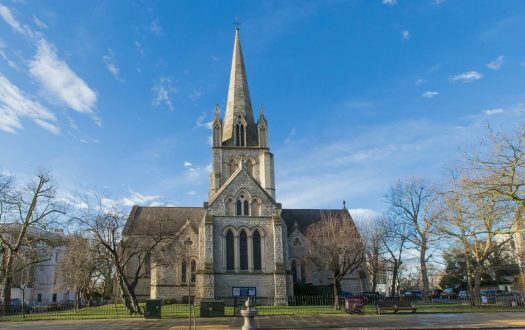 Formed in 1881, the Mission held services in railway waiting rooms, canteens, and engine sheds throughout the country, as well as in purpose-built facilities. There are seven chaplaincies that still function today, providing counseling and pastoral services to railway workers and their families. Norwich’s Railway Mission was built 1901-1903, the work of Edward Boardman & Sons, who were responsible for a variety of buildings in the Norwich area, many of which are still standing. The red brick building is significant for its rarity (it is one of few known examples of a purpose-built hall by the Railway Mission), architectural sophistication, intactness, and historical interest. The Railway Mission continued to hold services in the hall until the late 1990s. 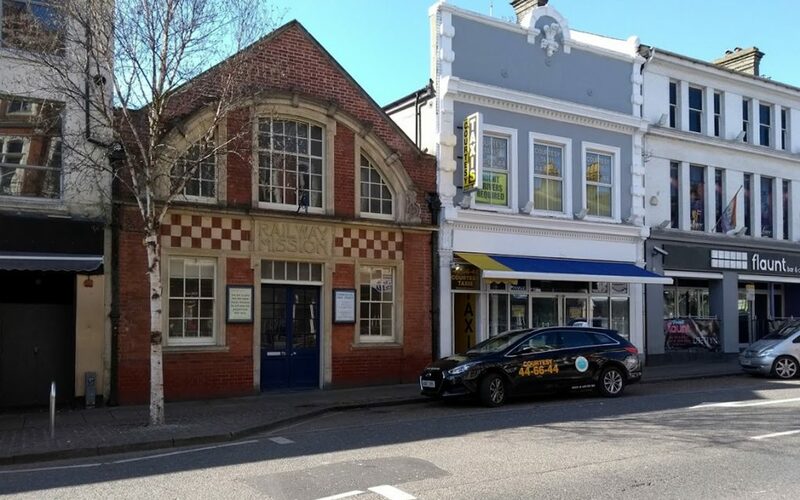 After acquiring the building, the Norwich Free Evangelical Church renovated the interior to suit its needs, inserting a suite of rooms that include a reception space, a worship space, a smaller meeting room, kitchen and toilets. The original stage remains intact, and one can still see glimpses of the old interior if one knows where to look. The church’s website gives little information about its history but sets out the kind of statement of belief that you might expect. There is a strong focus on Bible teaching and street outreach (preaching, handing out leaflets, engaging people one-on-one, etc.). 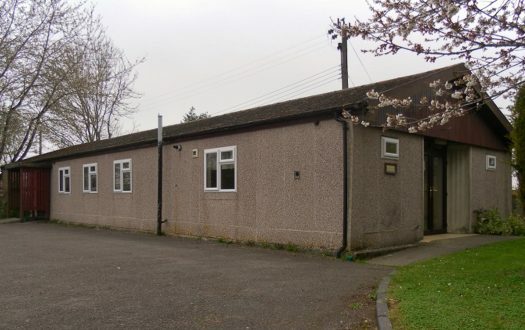 From September to June, the monthly East Anglian Bible Rallies are held in the church building. They maintain links to other churches in the Norwich area. There are morning and afternoon services each Sunday as well as a Wednesday evening prayer meeting and Bible study. I guess every city will have a street like the Prince of Wales Road, featuring as it does a range of establishments: gentlemen’s clubs (let the reader understand), American table dancing, drinking barns, night clubs, dirty kebab shops, street drinkers. (What is American table dancing?) Just next door to the mission, a nightclub promotes itself with photos of young ladies licking distinctively shaped lollipops. The façade of the Railway Mission boldly proclaims Christ in the midst of these. One person led, preached, prayed and noticed. One voice only for the entire service. The chap was dressed in smart trousers, shirt and tie, jumper. The worship space seats a total of perhaps 60 people. I reckon there were 40 people in attendance, including over 15 younger children and teenagers. Some women covered their heads. Yes – firm handshake and good morning, hymn book and Bible given. Handshake and names exchanged with my neighbour in the pew. Linked padded chairs in purple. Very comfortable. Could have done with an inch more knee room, though. No music before the service. Friendly low chatter that fell away as 10.30 approached. Well, there were two starts. Firstly: ‘Good morning and welcome to our worship,’ which preceded the notices; then: ‘Let us pray together’ before we really got going. Bible (New International Version, I think?) and Christian Hymns (published by the Evangelical Movement of Wales). None – hymn karaoke from the sound desk/laptop. No. And this was a problem. 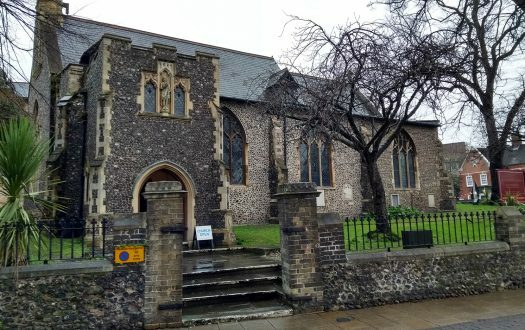 I cycled across Norwich to the church, following the path of the river Wensum. It was a beautiful spring day – daffodils, magnolia, willow, birds singing, blue sky, sun. By contrast, the worship space was a featureless box – no place provided for the natural world or beauty. It has no cross, flowers or adornments – just chairs, table, sound desk and hymn board. Welcome and notices, prayer, hymn, readings, hymn, ten minutes of extemporaneous prayer, hymn, sermon, hymn, final prayer. No congregational involvement in prayers or readings or notices. I suppose I would call it a very dry evangelicalism. The hymns were all very old, and the karaoke machine played them all a bit slowly. The prayers had that quality where the leader is struggling to reach toward a fervent sincerity that is just eluding him. I wondered what might be happening in the church community, as I felt that there were more than a few references (direct and indirect) to tough times. The pole that this church moves around is that of personal salvation through Christ (death and resurrection). There was very little mention of wider local or global concerns. No sense of God’s mission in Christ to reconcile all of creation. 32 minutes!! My usual diet is 10 minutes! 7 — Clear and audible, the preacher referred to notes in a clearly structured way. I did enjoy it when, after fifteen minutes and three points, he told us he had seven brief points to make. I found the term ‘backsliding’ unhelpful, but this may be a cultural thing – if I replaced it in my mind with (say) ‘wander from the Shepherd’ it worked better for me. And very little time was spent linking through to the gospel reading. At the end, I remained unsure of what I should do as a result of the sermon. Two readings: Luke 15:11-32 (the parable of the Prodigal Son) and 1 Samuel 27:1-28:2 (David finds favor among the Philistines). The sermon offered seven reflections on backsliding: (1) It can happen quickly (2) and often (we frequently repeat our mistakes); (3) it comes from fear; (4) it has limited success; (5) it can last a long time; (6) it can lead to increasing compromise. But (7) God can redeem the backslider and use the backslidden time. One can be transformed by divine grace (theosis – although he didn’t use the term). He also said that it’s easier to live other people’s lives than to live one’s own. The façade of the railway mission amongst the superficial filth of the Prince of Wales Road. The welcome and warmth (see below). Hymn karaoke, but then what can you do if you don’t have a musician? Also, I meet with God in the natural world, and I found it hard not to have that drawn into worship. No time to hang around! The chap in front of me took me under his wing and showed me the ‘old mission’ behind and above the new suite of rooms. We then shared coffee and swapped favourite local cycling routes. As I was about to leave, a lovely lady (one of the mums, I think) introduced herself and blessed me; in her blessing I unexpectedly felt the tangible presence of God’s Spirit. Hot, mug, too busy chatting to notice the quality. I was invited to stay for lunch but declined. 7 — Music and the natural world are two of the key elements in my approach to God, and so I don't think that this church would work for me long term. Why do we choose the churches that we do for Mystery Worship? As I cycled down to the Railway Mission I reflected that my choice may have been subconsciously influenced by very recently watching Guys and Dolls at a local theatre. Is there a parallel to the musical in the architecture and location of the Railway Mission? There was no buttoned-up missionary Sister Sarah, no con man Nathan Detroit, and no eccentric gambler Nicely Nicely Johnson; but I am grateful for this church’s witness on perhaps the most godless road in Norwich. The worship and theology are perhaps not my cup of tea, but their welcome, kindness and community certainly are. The Spirit-filled blessing as I left.